This is a list of notable Pacific hurricanes, subdivided by reason for notability. Notability means that it has met some criterion or achieved some statistic, or is part of a top ten for some superlative. It includes lists and rankings of Pacific hurricanes by different characteristics and impacts. Characteristics include extremes of location, such as the northernmost or most equator-ward formation or position of a tropical cyclone. Other characteristics include its central pressure, windspeed, category on the Saffir–Simpson scale, cyclogenesis outside of a normal hurricane season's timeframe, or storms that remain unnamed despite forming after tropical cyclone naming began in 1960. Another characteristic is how long a system lasted from formation to dissipation. These include the cost of damage, the number of casualties, as well as meteorological statistics such as rainfall point maximum, wind speed, and minimum pressure. Adolph and Israel were removed from the list of names during and after the 2001 season due to political sensitivities. Knut was removed from the list in 1988 for unknown reasons. Adele, Iva, and Fefa were also removed in 1970, 1988, and 1991 respectively for unknown reasons. Hazel was replaced in 1965. The name Isis was also pre-emptively removed from the lists of names for 2016 after being deemed inappropriate because of the eponymous militant group in 2015. 1871 First and one of only three known hurricanes to make landfall in the Hawaiian Islands. The following tropical cyclones have caused at least 100 deaths. The following tropical cyclones have caused at least $450 million in damage. In the Central Pacific Hurricane Center's (CPHC) area of responsibility (AOR), the season with the most tropical cyclones is the 2015 season with 16 cyclones forming in or entering the region. A season without cyclones has happened a few times since 1966, most recently in 1979. Before 1971 and especially 1966, data in this basin is extremely unreliable. The geostationary satellite era began in 1966, and that year is often considered the first year of reliable tropical records. Intensity estimates are most reliable starting in the 1971 season. A few years later, the Dvorak technique came into use. Those two factors make intensity estimates more reliable starting in that year. For these reasons, seasons prior to 1971 are not included. Naming of tropical cyclones in the eastern north Pacific began in the 1960 season. That year, four lists of names were created. The plan was to proceed in a manner similar to that of the western Pacific; that is, the name of the first storm in one season would be the next unused one from the same list, and when the bottom of one list was reached the next list was started. This scheme was abandoned in 1965 and next year, the lists started being recycled on a four-year rotation, starting with the A name each year. That same general scheme remains in use today, although the names and lists are different. On average, the eastern north Pacific sees about sixteen named storms per year. Before 1971 and especially 1966, data in this basin is extremely unreliable. The geostationary satellite era began in 1966, and that year is often considered the first year of reliable tropical records. Intensity estimates are more reliable starting in the 1971 season. A few years later, the Dvorak technique came into use. Those two make intensity estimates more reliable starting in that year. For these reasons, seasons before 1966 are not included in the lowest column. A meteorological enigma, Hurricane Ekeka formed in January and became a major hurricane. The Pacific hurricane season runs from May 15 to November 30. Only systems that develop or enter during the off-season are included. The earliest off-season storm is Pali in 2016 whilst the latest off-season storm was Nine-C during 2015. Tropical cyclones have received official names in the east-central Pacific region since 1960. Since this time, 5 systems that have formed in this area have not received a name, plus another possible unnamed subtropical or tropical system in 2006. Since 1959, only 18 Pacific hurricanes are known to have reached Category 5 and none made landfall while at this intensity. Since 1900, 126 Pacific hurricanes have attained Category 4 intensity, of which four made landfall at that strength. Since 1970, 81 Pacific hurricanes have attained Category 3 intensity, of which three made landfall at that strength. This lists all Pacific hurricanes that existed as tropical cyclones while in the Pacific Ocean east of the dateline for more than two weeks continuously. Hurricanes John and Dora spent some time in the west Pacific before dissipating. John spent eleven days west of the dateline; if that time was included John would have existed for a total of 30 days and 18 hours, a world record, while including Dora's time in the west Pacific would mean that it existed for 18 days. One Atlantic hurricane, Hurricane Joan, crossed into this basin and was renamed Miriam, giving it a total lifespan of 22 days, but not all of that was in the Pacific. 1993's Greg formed from the remnants of 1993's Tropical Storm Bret. Its time as an Atlantic system is excluded. All of these systems except Trudy, Olaf, and Connie existed in both the east and central Pacific, and all except Olaf were hurricanes. Hurricane Trudy of 1990 is thus the longest lived eastern Pacific hurricane to stay in the eastern Pacific. Tropical Storm Olaf of 1997 is hence the longest-lived eastern Pacific tropical cyclone not to reach hurricane intensity. No known tropical cyclone forming in the central north Pacific lasted for longer than 14 days without crossing into another basin. The tropical cyclone forming in the central Pacific that spent the most time there was 2014's Hurricane Ana at 12.75 days from formation to extratropical transition. Before the weather satellite era began, the lifespans of many Pacific hurricanes may be underestimated. This includes only systems which stayed a tropical cyclone during the passage or that maintained a circulation during the crossover. It used to be that when a Pacific named storm crossed North America and made it to the Atlantic (or vice versa), it would receive the next name on the respective basin's list. However, in 2000 this policy was changed so that a tropical cyclone will keep its name if it remains a tropical cyclone during the entire passage. Only if it dissipates and then re-forms does it get renamed. In addition to those, there are apparently two additional ones. One existed before 1856 and made it to the Gulf of Mexico. Another Pacific tropical cyclone crossed over central Mexico and also made it to the Gulf sometime after September 9, 1924. Neither eastern Pacific tropical cyclones passing 140°W, nor central Pacific tropical cyclones crossing the dateline, are notable events. However, very few eastern Pacific proper cyclones that enter the central Pacific make it to the dateline. † System ceased to be a tropical cyclone and regenerated at least once during its life span. ‡ Hurricane Li formed in the eastern Pacific, but was not named until it crossed into the central Pacific. In addition, Hurricane Jimena of 2003 is recognized per NHC, CPHC and JTWC as a storm that existed in all three areas of responsibility, but isn't recognized by the JMA as an official western Pacific tropical cyclone. Tropical cyclones crossing from the western Pacific to the central Pacific are fairly rare, and this has happened only seven times before. Of those seven times, five of them were storms which crossed the dateline twice; from the western to the central pacific and back (or vice versa). No tropical cyclone from the western Pacific has ever traveled east of 140°W. † System crossed the dateline twice. * Hurricane/Typhoon John formed in the eastern Pacific. In addition, Typhoon June of 1958 and Tropical Storm Wene of 2000 are recognized per CPHC as basin-crossing storms, but aren't recognized as such by the JMA. Also, Tropical Storm Moke of 1984 may have achieved this feat as well, however it isn't recognized as an official western Pacific tropical cyclone by either the JMA or the JTWC. Tropical cyclones crossing from the eastern Pacific to the central Pacific are routine; ones going the other way are not. That event has happened thrice. System crossed 140°W more than once. It was previously believed that an Unnamed Hurricane of 1975 crossed 140°W and is still included in the NHC as such, but according to a reanalysis made by the CPHC the storm became extratropical before doing so. 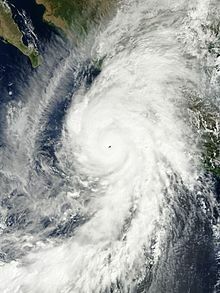 In addition, an unofficial cyclone formed on October 30, 2006 in the central Pacific subtropics. It eventually developed an eye-like structure. Its track data indicates that it crossed from the central to the east Pacific because it formed at longitude 149°W and dissipated at 135°W. NASA, which is not a meteorological organization, called this system a subtropical cyclone, and the Naval Research Laboratory Monterey had enough interest in it to call it 91C. The system has also been called extratropical. This cyclone is unofficial because it is not included in the seasonal reports of either Regional Specialized Meteorological Center. The apparent increase in recent seasons is spurious; it is due to better estimation and measurement, not an increase in intense storms. That is, until 1988, Pacific hurricanes generally did not have their central pressures measured or estimated from satellite imagery. Intensity is measured solely by central pressure unless the pressure is not known, in which case intensity is measured by maximum sustained winds. This tropical cyclone is the strongest to form in its month by virtue of its being the only known system. After October or before June, 1854 – A system considered a tropical cyclone makes landfall just north of the Golden Gate. October 2, 1858 – A hurricane makes a direct hit on Southern California before dissipating. The hurricane may or may not have made landfall in San Diego County, due to uncertainty in the track reconstruction. San Diego experienced hurricane-force winds, with torrential rainfall recorded all across Southern California. After October or before June, 1859 – A system considered a tropical cyclone makes landfall between Cape Mendocino and San Francisco Bay. September 25, 1939 – The 1939 California tropical storm makes landfall in San Pedro, California, killing 45 to 93 people. September 6, 1972 – Tropical Depression Hyacinth makes landfall. September 6, 1978 – Tropical Depression Norman makes landfall. August 9, 1871 - Indigenous sources suggest that a Category 3 hurricane struck the Big Island and Maui. August 7, 1958 – A tropical storm makes landfall on the Big Island of Hawaii. 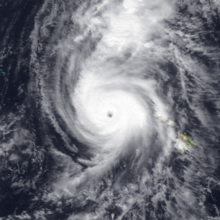 August 7, 1959 – Hurricane Dot makes landfall on Kauai. October 20, 1983 – Tropical Depression Raymond makes landfall on Molokai, Oahu, and Kauai. August 3, 1988 – Tropical Depression Gilma makes landfall on Maui and Molokai. September 11, 1992 – Hurricane Iniki makes landfall on Kauai, killing six throughout the islands. September 14, 1992 – Tropical Depression Orlene makes landfall on the Big Island. July 24, 1993 – Tropical Depression Eugene makes landfall on the Big Island of Hawaii. August 8, 2014 – Tropical Storm Iselle makes landfall on the Big Island of Hawaii, killing one on Kauai. July 24, 2016 – Tropical Storm Darby makes landfall on the Big Island of Hawaii. September 12, 2018 – Tropical Storm Olivia makes landfall on Maui and Lanai. All of these values are point maxima. Highest official wind speed ever recorded in a tropical cyclone: Hurricane Patricia with maximum sustained winds of 215 mph (345 km/h). Longest-lived tropical cyclone: Hurricane John lasted for 30 days and 18 hours. Farthest-travelling tropical cyclone: Hurricane John travelled for 13,280 km. Highest Accumulated cyclone energy (ACE) index for a tropical cyclone: Hurricane/Typhoon Ioke achieved an ACE index of 82. Tropical cyclone at Category 4 or 5 intensity on the Saffir-Simpson Scale for the longest: Hurricane Ioke was at that intensity for 198 consecutive hours. ^ "WMO Technical Document". World Meteorological Organization. Archived from the original (DOC/HTML) on May 29, 2005. ^ "'Isis' among names removed from UN list of hurricane names". Reuters. April 17, 2015. Retrieved April 17, 2015. ^ Christopher Landsea & Michael Chenoweth (November 2004). "The San Diego Hurricane of 2 October 1858" (PDF). Bulletin of the American Meteorological Society. American Meteorological Society. pp. 1689–98. Retrieved 2007-11-24. ^ a b Businger, Steven; M. P. Nogelmeier; P. W. U. Chinn; T. Schroeder (2018). "Hurricane with a History: Hawaiian Newspapers Illuminate an 1871 Storm". Bull. Amer. Meteor. Soc. 99 (1): 137–47. Bibcode:2018BAMS...99..137B. doi:10.1175/BAMS-D-16-0333.1. ^ Jack Williams (2005-05-17). "Background: California's Tropical Storms". USA Today. Retrieved 2007-11-24. ^ Hurd, Willis (September 1941). "Weather on the North Pacific Ocean" (PDF). Monthly Weather Review. Retrieved May 17, 2013. ^ a b R. G. Handlers & S. Brand (June 2001). "Tropical Cyclones Affecting Mazatlan". NRL Monterrey. Retrieved 2009-03-24. ^ "Atlantic and Pacific Records during the modern recorded era" (PDF). Hurricane.com. October 2011. Retrieved 2011-10-07. ^ E. Jáuregui (2003). "Climatology of landfalling hurricanes and tropical storms in Mexico" (PDF). Atmósfera. p. 200. Archived from the original (PDF) on 2007-12-01. Retrieved 2007-12-28. ^ "Mexico - Disaster Statistics". Prevention Web. 2008. Retrieved April 12, 2010. ^ "Nicaragua - Disaster Statistics". Prevention Web. 2008. Retrieved April 12, 2010. ^ Miles B. Lawrence (1997). "Hurricane Pauline Tropical Cyclone Report". National Hurricane Center. Archived from the original on 2005-09-25. Retrieved 2007-01-02. ^ a b Centre for Research on the Epidemiology of Disasters; Guha-Sapir, D. "EM-DAT: The Emergency Events Database". Université catholique de Louvain. Retrieved April 19, 2019. ^ "Hurricanes and Typhoons with Economic Losses of One Billion Dollars or More, 1950-2005" (XLS). Earth Policy. 2008. ^ "Aseguradores pagaron 16,600 mdp por daños del huracán Odile" (in Spanish). El Economista. December 17, 2014. Retrieved February 28, 2015. ^ "Hay daños evidentes en Lerdo por lluvias" (in Spanish). El Siglo de Durango. November 3, 2018. Retrieved November 4, 2018. ^ Ireri Piña (October 25, 2018). "Necesarios 35 mdp para solventar daños por "Willa"" (in Spanish). Contramuro. Retrieved October 26, 2018. ^ Guadalupe Martínez (October 30, 2018). "Confirman de manera preliminar daños por 350 MDP en Escuinapa por "Willa"" (in Spanish). Reacción Informativa. Retrieved October 31, 2018. ^ Espinosa, Gabriela (November 11, 2018). "Ascienden a $10 mil millones los daños que causó 'Willa' en Nayarit". La Jornada (in Spanish). Retrieved January 14, 2019. ^ "Guatemala - Disaster Statistics". Prevention Web. 2008. Archived from the original on July 22, 2011. Retrieved April 12, 2010. ^ "5 day toll in El Salvador, 630 killed, crops, destroyed". Achorage Daily Times. September 23, 1982. Retrieved August 5, 2011. ^ "El Salvador Death Toll hits 565 as more bodies found". September 22, 1982. Retrieved August 5, 2011. ^ Tucson, Arizona National Weather Service (2008). "Tropical Storm Octave 1983". National Weather Service. Retrieved July 12, 2013. ^ Oard, Michael (March 1, 2015). The New Weather Book (Wonders of Creation). Master Books. p. 54. ISBN 0890518610. ^ Todd B. Kimberlain; Eric S. Blake; John P. Cangialosi (February 1, 2016). Hurricane Patricia (PDF) (Report). Tropical Cyclone Report. Miami, Florida: National Hurricane Center. Retrieved February 4, 2016. ^ "Previous Tropical Systems in the Central Pacific". Central Pacific Hurricane Center. Retrieved 2007-12-31. ^ a b Michelle Mainelli; Jamie Rhome; Eric Blake & Daniel Brown (2007-08-01). "Tropical Weather Summary". National Hurricane Center. Retrieved 2007-12-23. ^ a b c d e Gary Padgett. "Monthly Global Tropical Cyclone Summary August 2000". Retrieved 2007-12-23. ^ "Untitled". Atlantic Tropical Weather Center. Retrieved 2007-12-29. ^ "Climate of 2006 East Pacific Hurricane Season". National Climatic Data Center. 2006-12-06. Retrieved 2006-12-29. ^ a b c d e f g h i j k l m n o National Hurricane Center; Hurricane Research Division; Central Pacific Hurricane Center. "The Northeast and North Central Pacific hurricane database 1949–2017". United States National Oceanic and Atmospheric Administration's National Weather Service. A guide on how to read the database is available here. ^ "Tropical Cyclone Climatology". FAQ. Central Pacific Hurricane Center. Retrieved 2007-11-25. ^ Central Pacific Hurricane Center. "Tropical Cyclones in the 1800s". United States National Oceanic and Atmospheric Administration's National Weather Service. Retrieved 2012-06-09. ^ a b c d Central Pacific Hurricane Center. Tropical Cyclones During the Years 1900-1952 (Report). United States National Oceanic and Atmospheric Administration's National Weather Service. Retrieved 2012-06-09. ^ F.G. Tingley (February 1922). "North Pacific Ocean" (PDF). Monthly Weather Review. American Meteorological Society. p. 99. Retrieved 2007-11-25. ^ Willis Hurd (February 1929). "Tropical Cyclones of the Eastern North Pacific Ocean" (PDF). Monthly Weather Review. American Meteorological Society. p. 48. Retrieved 2007-11-25. ^ Central Pacific Hurricane Center. Tropical Cyclones During the Years 1900–1952 (Report). United States National Oceanic and Atmospheric Administration's National Weather Service. Retrieved 2007-01-26. ^ a b c Central Pacific Hurricane Center. The 1980 Central Pacific Tropical Cyclone Season (NOAA Technical Memorandum NWSTM PR-22). United States National Oceanic and Atmospheric Administration's National Weather Service. Retrieved 2012-06-08. ^ Schultz. "Tropical Storm Winona (01W)" (PDF). 1989 Annual Tropical Cyclone Report. Joint Typhoon Warning Center. pp. 32–6. Retrieved 2014-08-16. ^ a b c d Central Pacific Hurricane Center. The 1992 Central Pacific Tropical Cyclone Season (Report). United States National Oceanic and Atmospheric Administration's National Weather Service. Retrieved November 28, 2007. ^ Sam Houston; Tom Birchard (December 22, 2016). Tropical Cyclone Report: Tropical Depression Nine-C (Report). Honolulu, Hawaii: Central Pacific Hurricane Center. Retrieved May 10, 2017. ^ Bob Henson (January 7, 2016). "Rare January Depression in Central Pacific; Atlantic Subtropical Storm Next Week?". Weather Underground. Retrieved May 10, 2017. ^ Doyle Rice (May 9, 2017). "Earliest Pacific tropical depression on record forms". USA Today. Retrieved May 10, 2017. ^ Avila, Lixion. "Tropical Depression One-E Advisory Number 5". National Hurricane Center. Archived from the original on 11 May 2018. Retrieved 11 May 2018. ^ a b c Stephen Caparotta; D. Walston; Steven Young & Gary Padgett. "Subject E15: What tropical storms and hurricanes have moved from the Atlantic to the Northeast Pacific or vice versa?". Frequently Asked Questions. NOAA. Archived from the original on 2010-05-27. Retrieved 2007-11-24. ^ a b c d "Atlantic hurricane best track (HURDAT version 2)". Hurricane Research Division (Database). National Hurricane Center. May 1, 2018. Retrieved April 19, 2019. ^ Jeff Powell (July 17, 2015). Tropical Cyclone Report: Hurricane Ana (DOC). Central Pacific Hurricane Center (Report). Honolulu, Hawaii: National Oceanic and Atmospheric Administration. Retrieved August 16, 2015. ^ a b c "Tropical Cyclone Records". FAQ. National Hurricane Center & Central Pacific Hurricane Center. Retrieved 2007-12-30. ^ William J. Denny (April 1972). "Eastern Pacific hurricane season of 1971" (PDF). Monthly Weather Review. 100 (4): 276–293. Bibcode:1972MWRv..100..276D. CiteSeerX 10.1.1.395.3350. doi:10.1175/1520-0493(1972)100<0276:EPHSO>2.3.CO;2. Retrieved 2009-06-09. ^ Gunther, Emil B (April 1, 1978). "Eastern North Pacific Tropical Cyclones of 1977". Monthly Weather Review. 106 (4): 546–558. Bibcode:1978MWRv..106..546G. doi:10.1175/1520-0493(1978)106<0546:ENPTCO>2.0.CO;2. ^ Emil B. Gunther; Eastern Pacific Hurricane Center (July 1979). "Eastern North Pacific Tropical Cyclones of 1978". Monthly Weather Review. 107 (7): 925–926. Bibcode:1979MWRv..107..911G. doi:10.1175/1520-0493(1979)107<0911:ENPTCO>2.0.CO;2. ^ Harold P. Gerrish (1988-11-27). "Hurricane Debby Preliminary Report Page 1". National Hurricane Center. Retrieved 2011-02-14. ^ Harold P. Gerrish (1988-11-27). "Hurricane Debby Preliminary Report Page 2". National Hurricane Center. Retrieved 2011-02-14. ^ David R. Roth (January 27, 2007). Hurricane Diana - August 4–14, 1990 (Report). College Park, Maryland: Weather Prediction Center. Retrieved December 18, 2013. ^ Roth, David M. (2010-05-10). Tropical Cyclone Rainfall Data. Camp Springs, Maryland: Hydrometeorological Prediction Center. p. Hurricane Gert/T.D. #14E – September 14–28, 1993. Retrieved 2011-10-14. ^ Lixion Avila (1996-10-24). "Hurricane Douglas". National Hurricane Center. Retrieved 2007-02-23. ^ Beven, Jack. "Tropical Storm Otto Discussion Number 17". National Hurricane Center. National Hurricane Center. Retrieved 30 November 2016. ^ Chris Landsea. "Subject: B5) What happens to the name of a tropical cyclone if it moves from the Atlantic regions to the Northeast Pacific, or vice versa?". FAQ. National Hurricane Center. Retrieved 2007-11-28. ^ a b c Stephen Visher (June 1922). "Tropical Cyclones in the Northeast Pacific, Between Hawaii and Mexico" (PDF). Monthly Weather Review. American Meteorological Society. p. 296. Retrieved 2007-11-25. ^ "Hurricane #4" (GIF). Unisys. Retrieved 2007-11-25. ^ "Hurricane #3" (GIF). Unisys. Retrieved 2007-11-24. ^ "Tropical Storm 1" (GIF). Unisys. Retrieved 2007-11-25. ^ Hurricane Specialists Unit (2009). "Easy to Read HURDAT 1851–2009". National Hurricane Center. Archived from the original on 15 May 2010. Retrieved May 20, 2010. ^ a b Willis Hurd (February 1929). "Tropical Cyclones of the Eastern North Pacific Ocean" (PDF). Monthly Weather Review. American Meteorological Society. p. 47. Retrieved 2007-11-25. ^ Steve J. Fatjo. "Typhoons Georgette (11E) and Tip (10W)" (PDF). 1986 Annual Tropical Cyclone Report. Joint Typhoon Warning Center. pp. 58–66. Archived from the original (PDF) on 2011-06-07. Retrieved 2007-12-28. ^ "Tropical Storm Enrique (06E)" (PDF). 1991 Annual Tropical Cyclone Report. Joint Typhoon Warning Center. pp. 70–1. Archived from the original (PDF) on 2011-06-07. Retrieved 2007-12-28. ^ Central Pacific Hurricane Center. The 1994 Central Pacific Tropical Cyclone Season (Report). United States of America: National Weather Service. Retrieved 2007-11-28. ^ Miles Lawrence (1995-01-03). "Preliminary Report Hurricane John (file 6)" (GIF). National Hurricane Center. Retrieved 2007-12-25. ^ Miles B. Lawrence & Todd B. Kimberlain (1999-11-23). "Preliminary Report Hurricane Dora". National Hurricane Center. Archived from the original on 2012-04-08. Retrieved 2007-12-25. ^ Kristina Pydynowski (August 7, 2014). Rare Switch for Genevieve: Hurricane to Super Typhoon (Report). Accuweather. Retrieved August 7, 2014. ^ Houston, Sam. "Tropical Storm Hector Advisory Number 53". Central Pacific Hurricane Center. Retrieved 13 August 2018. ^ Richard B. Pasch (2003-12-18). "Tropical Cyclone Report Hurricane Jimena". National Hurricane Center. Retrieved 2007-12-25. ^ a b c Central Pacific Hurricane Center. "CPHC Rebest 1966-2003" (XLS). Retrieved August 15, 2016. ^ a b "JMA Best Track Data" (TXT). Japan Meteorological Agency. Retrieved August 15, 2016. ^ Central Pacific Hurricane Center. The 1959 Central Pacific Tropical Cyclone Season (Report). United States of America: National Weather Service. Retrieved 2015-07-19. ^ Central Pacific Hurricane Center. The 1968 Central Pacific Tropical Cyclone Season (Report). United States of America: National Weather Service. Retrieved 2015-07-19. ^ Pao-Shin Chu; Peng Wu (2008). Climatic Atlas of Tropical Cyclone Tracks over the Central North Pacific (PDF) (Report). University of Hawaii-Manoa. Retrieved August 2, 2015. ^ Central Pacific Hurricane Center. The 1985 Central Pacific Tropical Cyclone Season (Report). United States of America: National Weather Service. Retrieved 2015-07-19. ^ a b Central Pacific Hurricane Center. The 1994 Central Pacific Tropical Cyclone Season (NOAA Technical Memorandum NWSTM PR-41). United States National Oceanic and Atmospheric Administration's National Weather Service. Retrieved November 28, 2007. ^ Central Pacific Hurricane Center. The 1996 Central Pacific Tropical Cyclone Season (Report). United States of America: National Weather Service. Retrieved 2015-07-19. ^ Central Pacific Hurricane Center. The 2010 Central Pacific Tropical Cyclone Season (Report). United States of America: National Weather Service. Retrieved 2015-07-19. ^ Central Pacific Hurricane Center. The 2000 Central Pacific Tropical Cyclone Season (Report). United States of America: National Weather Service. Retrieved 2015-07-19. ^ Kodama, Forecaster. "Tropical Storm Olaf Discussion 48". Central Pacific Hurricane Center - Honolulu, Hawaii. Central Pacific Hurricane Center - Honolulu, Hawaii. Retrieved 27 October 2015. ^ Jelsema, Forecaster. "TROPICAL STORM ULIKA ADVISORY NUMBER 5". Central Pacific Hurricane Center - Honolulu, Hawaii. Central Pacific Hurricane Center - Honolulu, Hawaii. Retrieved 27 September 2016. ^ a b "Subtropical Storm off the Coast of Oregon". NASA. November 2, 2006. Archived from the original on February 21, 2011. Retrieved 2007-12-11. ^ Gary Padgett & Karl Hoarau. "Global Tropical Cyclone Tracks - November 2006". Retrieved 2007-12-28. ^ "2006 Atlantic Hurricane Season Review". Canadian Hurricane Center. Archived from the original on 2007-07-26. Retrieved 2007-12-28. ^ a b "The 2006 Central Pacific Tropical Cyclone Season". Central Pacific Hurricane Center. Retrieved 2007-11-28. ^ "2006 Eastern Pacific Hurricane Season". National Hurricane Center. Retrieved 2007-12-28. ^ a b Gunther, Emil B. (April 1, 1977). "Eastern Pacific Tropical Cyclones of 1976". Monthly Weather Review. 105 (4): 508–522. Bibcode:1977MWRv..105..508G. doi:10.1175/1520-0493(1977)105<0508:EPTCO>2.0.CO;2. ^ Franklin, James L (December 26, 2002). Hurricane Kenna 2002 (Tropical Cyclone Report). United States National Oceanic and Atmospheric Administration's National Weather Service. Archived from the original on July 16, 2014. Retrieved May 26, 2012. ^ Gunther, Emil B; Cross, R.L. (1984). "Eastern North Pacific Tropical Cyclones of 1983". Monthly Weather Review. 112 (7): 1419–1440. Bibcode:1984MWRv..112.1419G. doi:10.1175/1520-0493(1984)112<1419:ENPTCO>2.0.CO;2. ^ Knabb, Richard D (November 3, 2006). Hurricane Lane 2006 (PDF) (Tropical Cyclone Report). United States National Oceanic and Atmospheric Administration's National Weather Service. Retrieved May 26, 2012. ^ Daniel P. Brown and Christopher W. Landsea (September 15, 2014). Hurricane Odile Tropical Cyclone Update: Odile Makes Landfall Near Cabo San Lucas. National Hurricane Center (Report). Miami, Florida: National Oceanic and Atmospheric Administration. Retrieved September 15, 2014. ^ Blake, Eric (October 24, 2018). "Hurricane Willa Tropical Cyclone Update". Miami, Florida: National Hurricane Center. Retrieved October 24, 2018. ^ Baum, Robert A (1976). "Eastern North Pacific Tropical Cyclones of 1975". Monthly Weather Review. 104 (4): 475–488. Bibcode:1976MWRv..104..475B. doi:10.1175/1520-0493(1976)104<0475:ENPTCO>2.0.CO;2. ^ Mayfield, Britt Max (November 18, 1989). Hurricane Kiko 1989 (Report). United States National Oceanic and Atmospheric Administration's National Weather Service. p. 1. Retrieved May 26, 2012. ^ Willis E. Hurd (September 1939). "North Pacific Ocean, 1939" (PDF). Monthly Weather Review. American Meteorological Society. pp. 357–8. Retrieved 2007-12-13. ^ "A History of Significant Weather Events in Southern California" (PDF). National Weather Service Forecast Office San Diego. February 2010. p. 14. Retrieved 22 January 2016. ^ "Hurricane HYACINTH". Unisys. Archived from the original (GIF) on 2007-01-03. Retrieved 2007-12-13. ^ "Hurricane NORMAN". Unisys. Archived from the original (GIF) on 2007-01-02. Retrieved 2007-12-13. ^ "Tropical Storm #7" (GIF). Unisys. Retrieved 2007-12-24. ^ "Hurricane DOT" (GIF). Unisys. Retrieved 2007-12-24. ^ "Hurricane RAYMOND" (GIF). Unisys. Retrieved 2007-12-24. ^ "Tropical Storm GILMA" (GIF). Unisys. Retrieved 2007-12-24. ^ "Hurricane EUGENE" (GIF). Unisys. Retrieved 2007-12-24. ^ "Tropical Storm Iselle makes landfall on Hawaii". Fox News. Retrieved 24 July 2016. ^ "Hawaii battered by Tropical Storm Darby". Republish News. Al Jazeera. Retrieved 24 July 2016. ^ "Tropical Storm Olivia makes landfall in Hawaii". CNN News. CNN. Retrieved 21 October 2018. ^ a b David M. Roth. "Hurricane Juliette" (GIF). Hydrometeorological Prediction Center. Retrieved 2007-12-28. ^ a b David M. Roth. "Hurricane Pauline" (GIF). Hydrometeorological Prediction Center. Retrieved 2007-12-28. ^ a b David M. Roth. "Hurricane Odile" (GIF). Hydrometeorological Prediction Center. Retrieved 2007-12-28. ^ a b David M. Roth. "Hurricane Isis" (GIF). Hydrometeorological Prediction Center. Retrieved 2007-12-28. ^ a b David M. Roth. "Hurricane Flossie" (GIF). Hydrometeorological Prediction Center. Retrieved 2007-12-28. ^ a b David M. Roth. "Hurricane Greg" (GIF). Hydrometeorological Prediction Center. Retrieved 2007-12-28. ^ a b David M. Roth. "Hurricane Nora" (GIF). Hydrometeorological Prediction Center. Retrieved 2007-12-28. ^ David M. Roth. "Hurricane Eugene" (GIF). Hydrometeorological Prediction Center. Retrieved 2007-12-28. ^ David M. Roth. "Tropical Storm Lidia" (GIF). Hydrometeorological Prediction Center. Retrieved 2007-12-28. ^ David M. Roth. "Hurricane Ignacio" (GIF). Hydrometeorological Prediction Center. Retrieved 2007-12-28. ^ Central Pacific Hurricane Center. Tropical Cyclones During the Years 1900-1952 (Report). United States National Oceanic and Atmospheric Administration's National Weather Service. Retrieved January 26, 2007. ^ Roth, David M.; Hydrometeorological Prediction Center. "Remains of Paul". Tropical Cyclone Point Maxima (GIF). United States National Oceanic and Atmospheric Administration's National Weather Service. Retrieved December 28, 2007. ^ David M. Roth. "Remains of Norma" (GIF). United States of America: Hydrometeorological Prediction Center. Retrieved 2007-12-28. ^ David M. Roth. "Hurricane Tico Tropical Depression #22" (GIF). United States of America: Hydrometeorological Prediction Center. Retrieved 2007-12-28. ^ David M. Roth. "Hurricane Kathleen" (GIF). United States of America: Hydrometeorological Prediction Center. Retrieved 2007-12-28. ^ David M. Roth. "Hurricane Roslyn" (GIF). United States of America: Hydrometeorological Prediction Center. Retrieved 2007-12-28. ^ David M. Roth. "Remains of Octave" (GIF). United States of America: Hydrometeorological Prediction Center. Retrieved 2007-12-28. ^ National Weather Service Forecast Office Phoenix Arizona. "Top Arizona Hurricane/Tropical Storm Events". United States of America: National Weather Service. Retrieved 2007-12-28. ^ "A History of Significant Weather Events in Southern California" (PDF). National Weather Service Forecast Office San Diego. January 2007. p. 10. Archived from the original (PDF) on 2008-02-29. Retrieved 2007-12-28. ^ David M. Roth. "Hurricane Paine" (GIF). United States of America: Hydrometeorological Prediction Center. Retrieved 2007-12-28. ^ David M. Roth. "Hurricane Ismael" (GIF). United States of America: Hydrometeorological Prediction Center. Retrieved 2007-12-28. ^ Lane Possibly Breaks Hawaii Tropical Cyclone Rainfall Record (Public Information Statement). National Weather Service Office in Honolulu, Hawaii. August 27, 2018. Archived from the original on August 28, 2018. Retrieved August 27, 2018. ^ Roth, David M; Hydrometeorological Prediction Center. "Remains of Paul" (GIF). Tropical Cyclone Point Maxima. United States National Oceanic and Atmospheric Administration's National Weather Service. Retrieved 2007-12-28. ^ Central Pacific Hurricane Center. The 1970 Central Pacific Tropical Cyclone Season (Report). United States National Oceanic and Atmospheric Administration's National Weather Service. Retrieved 2007-12-28. ^ Richard J. Pasch (October 23, 2015). Hurricane Patricia Discussion Number 14 (Report). Miami, Florida: National Hurricane Center. Retrieved October 23, 2015. ^ Todd B. Kimberlain; Eric S. Blake & John P. Cangialosi (February 1, 2016). Hurricane Patricia (PDF) (Report). Tropical Cyclone Report. Miami, Florida: National Hurricane Center. Retrieved February 4, 2016. ^ Mark Saunders, Adam Lea (2007). "Summary of 2006 NW Pacific Typhoon Season and Verification of Authors' Seasonal Forecasts" (PDF). Tropical Storm Risk. Archived from the original (PDF) on 2007-11-29. Retrieved 2007-10-11.